Oh boy. That will teach me to be overconfident! Hats off to all of you quilters out there. I found a quilt shop that is actually pretty close to my house, and lo and behold, they have classes. Just what a budding fabric junkie needs, right? Classes to learn to make things with all that yummy fabric that I can't seem to stop buying. They have a Saturday Sampler class (this is Close to Home in Unionville, CT) where you learn a new technique, or try a new gadget each month, and at the end of the year, you have enough blocks for a quilt. GREAT! A block a month. I can handle that, right??? 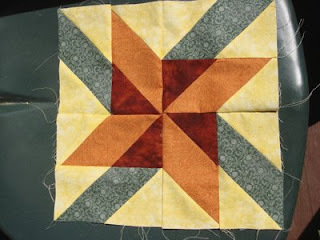 I started this with two very erroneous assumptions...one, that I can sew a straight line. HA! It's much harder than I thought. And two, that because I like math, and puzzles, I can cut squares neatly with a ruler. HA HA! I may use a fancy shmancy calculator at work and I may be good at fuzzy math, but cutting out perfectly square squares...not so much. I'm actually very pleased with the result, given that it's my first attempt. I'll take more pics once I have the border on my square. Can't WAIT to see what they have us building next month! Looks Great!!! Keep at it and you'll have a beautiful quilt, and a really cool feeling of accomplishment!